Oil on Canvas. 20" x 30"
Samuel W. Griggs, American,(1827 - 1898). 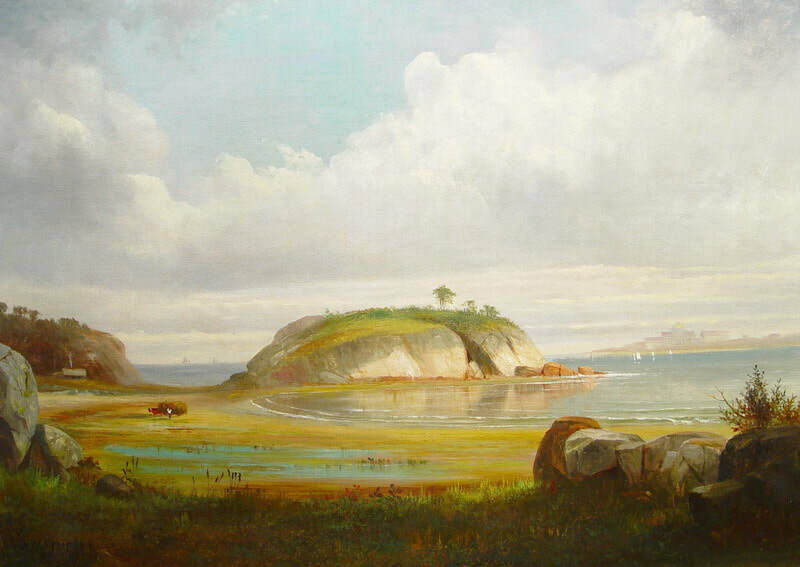 ​​​​​​Known as a painter of the White Mountains of New Hampshire, Samuel Griggs was listed as an architect in the Boston City directory from 1848 to 1852, and as an artist from 1854 until his death. The competency of his work strongly suggests that he had professional training, and it is believed that he studied under Albert Bierstadt before Bierstadt was well known. Griggs' earliest datable painting of a White Mountain scene is 1858. That year he exhibited three paintings, one of which was a White Mountain view (View on the Pemigewasset River), in an exhibition coordinated by Albert Bierstadt and held in New Bedford, Massachusetts. He also exhibited at the Boston Athenaeum from 1855 to 1863, as well as the Boston Art Club at various times. At the time of his death in 1898, he was living at #63 Studio Building, in Boston.